Head of Joint List tells Al-Arabiya that terror wave is "most beneficial" to the Palestinian people. 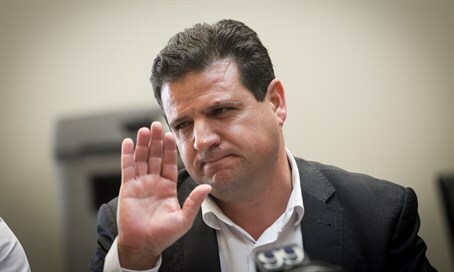 MK Ayman Odeh, head of the Arab Joint List, appeared on Friday to welcome the ongoing terrorist wave against Israelis. Speaking to the Al-Arabiya network and quoted by Channel 10 News, Odeh said that Palestinian acts of terror are a good strategy. Earlier this week, Odeh caused outrage when he claimed in a television interview that there are Jewish Knesset members who “murdered Arabs with their own hands”, and particularly singled out MK Avi Dichter (Likud), saying that when he was head of the Israel Security Agency (Shin Bet), Dichter “sent people who killed [former Palestinian Authority chairman Yasser] Arafat, as well as well as [senior Hamas leaders] Ahmed Yassin and Rantissi, and he is in the Knesset. He sent people to murder other people." The comments are the latest in a series of outrageous anti-Israel comments and actions by Arab MKs. Odeh's remarks on Dichter came after the Knesset's Constitution Committee approved a bill that would allow the Knesset to remove members with a majority of 90 votes. That bill was put together because a group of MKs from Odeh's party visited with families of terrorists who murdered Israelis and later defended their actions.